Make no mistake: India is charting a new course on South China Sea. At a time when China is deploying advanced radar systems to its man-made island in Cuarteron Reef in the Spratly Islands archipelago and the United States is nudging its allies to carry out their own freedom of navigation operations in the South China Sea to challenge China’s controversial assertions of maritime sovereignty, India’s role in the dispute is also assuming a new dimension. It was recently reported in sections of the media that the United States and India have held talks about conducting joint naval patrols that could possibly include the disputed South China Sea. U.S. and Indian government officials were quick to dismiss the report. Washington suggested that while the U.S. and India have a shared vision of peace, stability, and prosperity in Asia, the two countries were not planning joint maritime patrols in the Indian Ocean or the South China Sea. New Delhi also argued that there was no change in its policy of joining an international military effort only under the UN flag. Even though it seems clear that the U.S. and India are not yet politically ready for joint patrols, the trial balloon itself is indicative of the rapidly evolving Indian position on one of the key disputes in the Asian strategic landscape. A number of factors are forcing India’s hand. The United States itself has been forced to adopt a more robust posture in the Indo-Pacific. The dramatic acceleration in U.S. military commitment to the region is largely a function of the astonishing rise of China. China is today on the cusp of becoming a serious regional military power and this transition appears all the more menacing because of its aggressive posturing in the East and South China Seas, challenging the freedom of navigation in these waters and open access to the global commons. 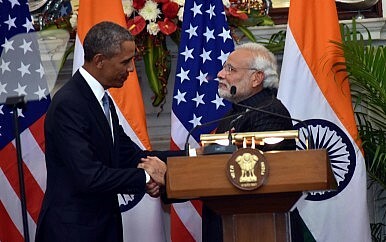 In their recent high-level joint statements, both the United States and India have repeatedly declared their support for freedom of navigation in the South China Sea, signaling that the Modi government is not reluctant to highlight New Delhi’s convergence with Washington on regional issues. India’s engagements with states like Japan, Vietnam, and Philippines have become more serious. India has publicly supported Vietnam and Philippines in their disputes with China. Indian naval ships have been visiting Vietnam in the South China Sea and the two nations have continued to cooperate on hydrocarbon exploration in the South China Sea, despite Beijing’s warnings. Make no mistake: India is charting a new course on South China Sea. Though its full implications will come to the fore only after some time, it is clear that it will have significant impact on how regional states and the United States view India as a regional balancer in the Asia-Pacific.